Back case fixed on case with 6 encapsulated hexagon screws. Watertight on axis reset and assured charge by PTFE gasket Bi-directional rotating bezel lockable with a lever on the right side of the case. Fixing of revolving bezel by 3 screws encapsulated in the back case; the bezel removing, for maintenance and washing obtained by removing the three screws, does not affect the watch watertight. Back case, case, bezel in titanium. Brown leather handcrafted, width 23/23, and fitted with a titanium tongue buckle. 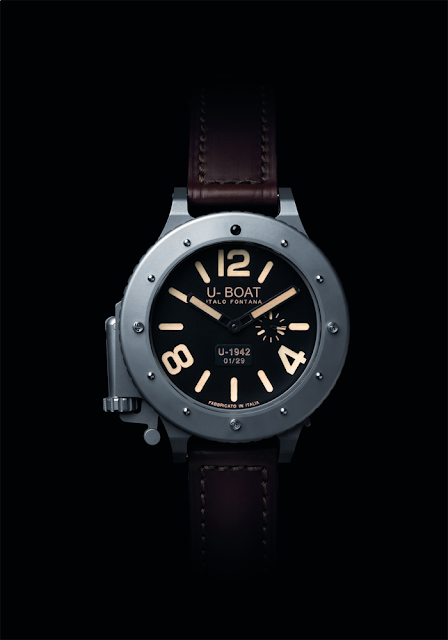 For the ref 6475, strap with plate in titanium with tag for personalization.